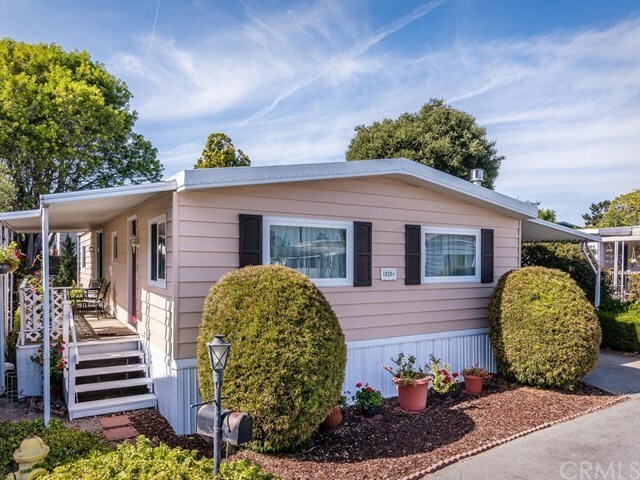 This 2-bedroom, 2-bath home was manufactured in 1975 and has been beautifully remodeled with contemporary design features. It is situated on a pie shaped lot with two decks â one attached, one detached. The detached deck sits under mature trees providing a lovely setting for relaxing or entertaining. Many upgrades (see detailed list on reverse side) include dry wall, dual pane windows, doors, recessed lighting, solar tubes, laminate floor, crown molding, granite counters, under counter lighting with dimmers, stainless sink and appliances, breakfast bar, custom tile, kitchen cabinetry with special features, ceiling fans, paint, skirting. This is a 24 x 54 doublewide with 1296 square foot. Refrigerator, washer, dryer, large storage shed, and three vinyl storage units are included. Laguna Lake Mobile Estates offers two clubhouse buildings with kitchens, meeting rooms, library, laundry room, exercise room, pool and spa. The attractive space rent to the Buyer will be only $680.44. Donât miss this one! Information not verified. Directions: From Prefumo Canyon Road turn onto Headley. Turn right onto Thelma Drive. Property is on right just before curve. Inclusions: Refrigerator, Washer, Dryer Storage Shed, 3 vinyl storage units.